I had a great time with my little cutiepies yesterday and my wonderful husband who cooked me dinner (and cleaned up afterwards!!! Lol!) 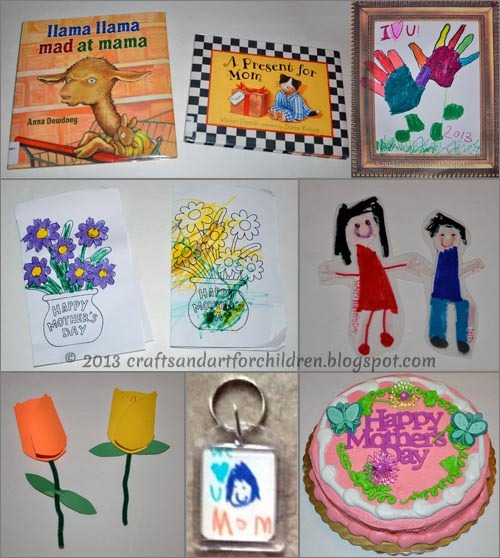 Here are the crafts and activities we did in honor of Mother’s Day. Llama Llama Mad at Mama Llama llama and his Mama go to the Shop-o-rama where he doesn’t like to go. He ends up having llama drama so Mama decides to make it more fun by shopping as a team. Llama llama likes that and is happy then. Such a cute story! My son thinks it’s funny when he wants to get mad about something and I say “Oh oh, are you having llama drama?” He then forgets about what he was mad about and starts to laugh. A Present for Mom This is an adorable story about a cat named Stanely and his journey for finding the perfect gift for his Mom for Mother’s Day. All of his siblings have their gifts planned out but none of his work out so he goes to bed and wakes up still not knowing what to give her. Finally he figure’s out the perfect gift. I won’t ruin the ending because it is so sweet and a must read for sure. My son and I tried to guess what it was going to be and both of us were wrong, but it was fun to try. It was the perfect gift in my opinion! On Saturday we went to the library storytime where they listened to books about moms, danced, and made a folded flower craft and colored a card with flowers on it. They had everything pre-cut for the rose card including a pipe cleaner stem. My son wrote “Dear Mom, Happy Mother’s Day!” inside his and Little Sister had a blast pretending to smell hers! Last week, the kids made scratch art key chains (see 5 of the 6 we did here). I helped Little Sister do the scratch art side by placing & holding a tiny bunny stencil in place that I first outlined for her. She scratched it all by herself. Big Brother drew a picture of me on the other side and wrote “We Love U Mom” on it. I love it!! My son also made me this beautiful Handprint Flower Drawing and in preschool he made me a precious Mommy & Me Magnet including a way-too-cute saying. As if I needed an excuse to eat cake, I let Little Sister pick one from the Mother’s Day cakes they had displayed at the grocery store.